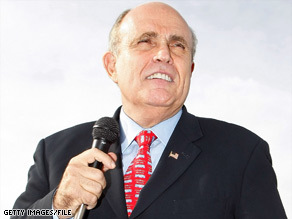 Editor's Note: Rudy Giuliani served two terms as mayor of New York City and was a Republican candidate for president in 2008. Rudy Giuliani says New York needs an advocate in the Senate who also understands America's needs. NEW YORK (CNN) -- Now that President-elect Barack Obama has nominated Sen. Hillary Clinton to be his secretary of state, the governor of New York will appoint a new senator to fill the vacancy. The relationship between the mayor of a large city and a United States senator from that city's state reveals the genius of the U.S. Constitution. A good senator must perform two tasks simultaneously -- advocate for the interests of his (or her!) state while also helping to shape the direction of the entire country. As mayor of New York City, I thought of our U.S. senators as New York's advocates in Washington. All of New York's senators during the time I was mayor -- Alfonse D'Amato, Daniel Patrick Moynihan, Charles Schumer and Hillary Clinton -- were effective advocates for New York City. Each understood the crucial role that New York City plays in New York's economy and in America's economy, as the place that develops the capital that makes the economy work -- the heart that pumps the blood, so to speak. When New York City is functioning well, the entire economy is functioning well. As we see today, when the city's financial industry is not functioning well, the entire country struggles. As the nation's biggest city, New York City needs an advocate with the toughness to fight for everything to which we are entitled. That means winning the internal battles in the Senate, as well as standing up to the rest of Congress and the White House and administrative agencies. The mayor of New York City -- or of any big city -- has to be able to picture his state's U.S. senator standing up to legislators from other parts of the country advocating for their own region's needs. For example, one of the first things Sen. Moynihan did after being elected in 1976 was to initiate a yearly survey that compared how much a state's residents sent to Washington compared to how much the state received back in federal aid. While many Americans assumed New York received a lot more than it gave, Sen. Moynihan proved the reverse was true, and used that fact to advocate for New York. A senator also needs a deep understanding of the many formulas that are used to calculate federally distributed aid. Some of these formulas are structured in a way that benefits less-populated areas. Medicaid, for example, has been based on a state's per capita income, regardless of that state's number of recipients or healthcare costs. So a state like New York, which has high per capita income but large numbers of recipients and high health care costs, might receive from Medicaid as little as 50 percent of its costs. Other states get more than 70 percent of their costs covered by the federal program. That's the sort of thorny policy issue that requires a senator to possess deep knowledge of an obscure distribution formula. But a senator should also bring a point of view -- a set of principles and beliefs that allows a consistent message to be articulated. The Senate is a collegial body, where the ability to build support and command respect among one's peers is vital to passing legislation that benefits one's home state and the country as a whole. New York City and New York state -- and indeed, our nation as a whole -- deserve a senator from New York who will both advocate for America's biggest city and third biggest state, and help advance and elevate America. The opinions expressed in this commentary are solely those of Rudy Giuliani.